Tom Baker is the Doctor in The Renaissance Man. There are several reasons the Doctor travels with a companion. Sometimes, he gets lonely. Sometimes, as a man who has seen nearly everything the universe has to offer, he wants to see its myriad of wonders through someone else’s eyes. Often, he wants someone who will smile and tell him how clever he is. And every now and then, he loves to teach someone a thing or two, acting more as an instructor than as a Doctor. The teacher/student relationship is nothing new to Doctor Who. The dichotomy was at its strongest during the Seven/Ace pairing, so much that Ace called the Doctor “Professor” more often than not. Had the series not been cancelled, future seasons would have revealed that the Seventh Doctor was in fact grooming Ace to become a Time Lord herself! Alas, that storyline never came to pass, but throughout several serials, the Doctor taught Ace a series of lessons, some of them harsh, some of them even hurtful, but always with the end goal of making her a better person. While Four and Leela didn’t have the instructor-and-pupil chemistry that Seven and Ace did, Four would often do his best to show the noble savage from the future about humanity’s past. The pair travelled throughout history in serials such as The Talons of Weng-Chiang and The Horror of Fang Rock. As opposed to the harsh lessons of Seven, Four was more of a guide, showing Leela history and then letting her draw her own conclusions…and stepping in only if Leela threatened to harm someone in the process! The Renaissance Man is a great recovery from the misstep that was Destination: Nerva. So seamlessly does this serial roll along, it could have been a lost television serial from that time period, as a strong script with cracking dialogue and a unique concept is magnified by the wonderful chemistry between Tom Baker and Louise Jameson. The Monrovian Museum is known across the galaxy for many things, and one of them is for being the most accurate representation of medieval Earth history ever assembled. The Fourth Doctor and Leela arrive at the Museum, intending on researching Leela’s ancestors, but instead find themselves in a quaint English village overseen by the enigmatic collector Harcourt. It doesn’t take long for the Doctor to deduce that the village is part of a different museum, a living history where the knowledge of the entire universe is being gathered. But is the massive breadth and scope of the project worth the means with which the information is being collected? The Renaissance Man must have been one of the scripts that Tom Baker enjoyed, because he throws himself into the part with gusto. As opposed to the dry readings and “shouting is anger/concern” that summed up his performance in Destination: Nerva, Baker’s larger-than-life presence makes the dialogue of Justin Richards’ script come alive. Could any other Doctor pull off a line such as “What a wonderful armchair! Lovely arms?” But when the mood gets serious, Baker gets quiet, and the listener knows things are about to take a turn just by the tone of his voice, with his anger and disappointment at the villain of the piece as the masks come off. This should have been the performance to kick off this season, as a few rewrites could have put it directly after The Talons of Weng-Chiang, as Baker simply crushes it. The other high point of Baker’s performance is his wonderful chemistry with Louise Jameson. On television, Baker was a bit dour and Jameson was a bit intimidated, so their time together felt just a little off, like the Doctor was babysitting Leela rather than travelling with her. Time and tide, though, have given the pair perfect timing, as they play off each other, with Leela giving it just as good as the Doctor can as she realizes just how mad the wise man she’s travelling with truly is. While the physical huntress traits are present (Leela knows five ways to catch a butterfly off the top of her head, and a net is not one of them), the character does not come off as dumb or unenlightened. Instead, she’s curious, inquisitive, and willing to admit the people of this age have no idea what they’re doing. Leela truly comes into her own as a companion with Big Finish, both in the Gallifrey series and now with the Fourth Doctor, as Jameson takes full advantage of the chance to expand the character. Ian McNeice, an actor with a long list of credits to his name including the HBO series Rome, is best known to recent fans of Doctor Who as Winston Churchill, primarily seen in Victory of the Daleks. As Reginald Harcourt, curator of the Collection, McNeice plays one of the best type of villain; one who feels completely and utterly justified in their actions. Knowledge is important, and all knowledge should be collected and stored away instead of being lost forever in fires, floods, or the death of experts. McNeice plays the part of Harcourt like a proud father, boasting of the work he’s done to ensure the safeguarding of the universe’s intellect, even when called on the carpet about his methods. Harcourt would have fit perfectly as a villain during the Hinchcliffe/Williams era, as a charming but ruthless and self-assured character. The theme of The Renaissance Man is actually one of the central themes of the entire Doctor Who universe; knowledge vs. experience. Harcourt wishes to keep knowledge safe and secure, but in a cold, mathematical manner, while the Doctor believes things to be experienced and enjoyed/endured in order to truly understand them. The Time Lords, safe on Gallifrey, have the Matrix to keep track of the Web of Time, knowing all that has happened and all that will happen, but the Doctor is the one who is out there in the universe, making a difference and seeing all those events as they actually happen. Which is better, to be the bird in the gilded cage, or to be the bird at risk in flight? We all know what way the Doctor leans, and his anger at the way Harcourt collects and catalogs his knowledge burns him to the core. How a secondary character reacts to the way the knowledge was taken from them is a total shock and a truly dramatic moment that crystalizes the entirety of the Doctor’s argument…and the way the Fourth Doctor beings the whole thing crashing down, as only he can, is satisfying on both a narrative and a character level. 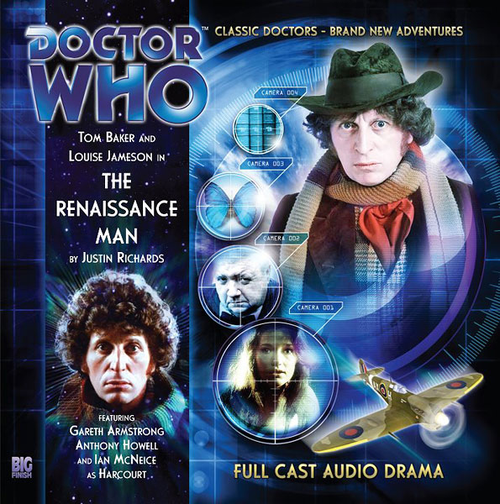 In the end, The Renaissance Man is a strong outing from Big Finish that showcases just why fans were excited to hear that Tom Baker was coming to the world of audios, and Baker rewards that excitement with a great performance that shows the very nature of the Doctor and shows just why he left Gallifrey all those years ago, leaving behind stuffy academia for grand adventure. Synopsis – The Renaissance Man is the true return of Tom Baker to the role of the Doctor, with a tight, tense story and high-level performances, all why asking just how far would someone go for the sake of knowledge. 4/5. Tom Baker is the Doctor in The Wrath of the Iceni. This entry was posted in Big Finish Review and tagged 4/5, Big Finish, Doctor Who, Fourth Doctor, Leela, TARDIS, Tom Baker. Bookmark the permalink. Great review of this story. I agree that this would have been a much better start to this season. Look forward to your thoughts on Iceni (my favorite from this first season of Fourth Doctor audio adventures).